BY BETTINA SPECHT One out of every five emails you send may not ever reach your subscriber’s inbox. One out of every five emails you send may not ever reach your subscriber’s inbox. You put a lot of work into growing your list, designing a beautiful campaign, and writing a strong subject line, and still, a percentage of your subscribers may not ever see your email. Low delivery rates are one of the most critical challenges email marketers face. While many factors affect your deliverability, spam traps are one of the biggest and most misunderstood of them all. Spam traps are commonly used by inbox providers and blacklist providers to catch malicious senders, but quite often, legitimate senders with poor data hygiene or acquisition practices end up on the radar as well. A spam trap looks like a real email address, but it doesn’t belong to a real person nor is it used for any kind of communication. Its only purpose is to identify spammers and senders not utilizing proper list hygiene. WHY SHOULD YOU CARE ABOUT SPAM TRAPS? You might already send email to spam traps and not even know about it. 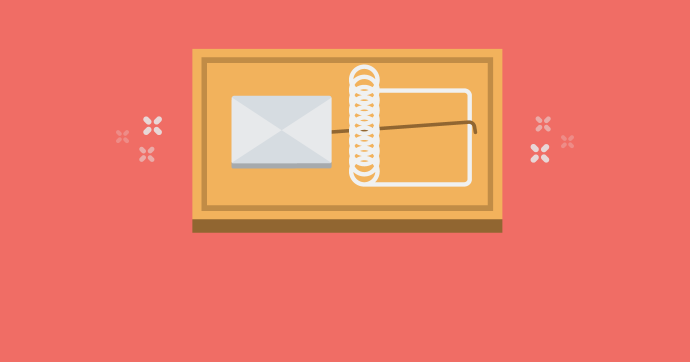 Depending on the type of trap, having even one spam trap on your mailing list can significantly impact your ability to get your emails into the inboxes of your subscribers. If you’re sending email to spam traps, it’s considered an indicator that you’ve used bad practices to collect email addresses—or at the very least, you didn’t do a good job of keeping your list clean. To the anti-spam organizations and inbox providers, this makes you look like a spammer, which could have an impact on your sender reputation. And senders with a bad reputation may not get their emails delivered to their subscribers’ inboxes. HOW DID A SPAM TRAP END UP ON MY MAILING LIST? To understand how a spam trap can end up on your mailing list it is important to know the different kinds of spam traps that are out there. Laura Atkins, email deliverability expert and owner of Word to the Wise, put together a comprehensive list of spam trap categories. Pristine traps are email addresses that are published on public web sites, but hidden so a normal user would never see them. The only people who find and send to those addresses are the people who use bad collection processes, like scraping the web for everything that looks like an email address. If you obtained addresses by scraping them from web pages—or bought a list, which often include scraped email addresses—you may have picked up a pristine spam trap. Recycled Traps are email addresses that were used by real people in the past, became abandoned, and at some point were converted into a trap by the inbox provider. When an email is not used anymore, inbox providers will deactivate it after a certain time. Whenever someone sends an email to this address, the inbox provider returns a hard bounce, which is a signal to the sender to please remove this email address from the list. Responsible senders honor this request and delete bouncing addresses, but some folks ignore this protocol and continue to email these addresses. Turning abandoned email addresses into spam traps is the ISP’s response to irresponsible senders. After some time, the abandoned address won’t return a hard bounce anymore but is now an active spam trap that marks everyone sending email to it as a misbehaving sender. Keeping bounced addresses is how you get a dead address trap on your list. Make sure you’re actively looking after your list, especially for bounces, so that you don’t accidentally continue to email a dead address. You can also run into recycled spam traps in your lapsed subscribers you don’t mail often. Potentially, you could hit a trap simply because you haven’t mailed the address in years and never received that bounce. But there are even more ways you can pick up spam traps. For instance, some people who want to complete an entry form but don’t want to be emailed will make up email addresses. In other cases, a well-intentioned person might accidentally misspell their address and that misspelling could be a spam trap’s address. HOW DO I KNOW WHETHER I’M SENDING TO A SPAM TRAP? Since spam traps look like regular email addresses, it’s hard to spot them in your mailing list. However, there are a few handy tools that help you evaluate your sender reputation and show whether or not you’re sending to any spam traps. Microsoft’s Smart Data Network Service (SNDS) is one example for such a tool. Spam traps are designed to identify senders with irresponsible list building techniques, so you won’t find a public list of traps that you can delete from your list to solve the problem. The only way of finding and deleting them is to take a close look at your list quality in general. Spam traps don’t belong to real people, so they typically won’t behave like an engaged subscriber. Most spam traps won’t show engagement like clicks or opens. If you actively manage your inactive subscribers, you’ll likely get rid of your spam traps, too. Running a campaign that asks existing subscribers to reconfirm their interest in your messages is another strategy to separate engaged subscribers from those who don’t confirm (and might be spam traps). But even if you managed to identify the traps and delete them from your list, you’ve only treated the symptom, not the cause. You need to understand how the spam traps made it to your list in the first place and fix your list building strategy to prevent further spam traps. Generally, traps will appear in either your most recent signups, or in your oldest inactive segments, so make sure you focus on both angles to keep spam traps off your list. When buying a list, you don’t know whether or not the email addresses were being collected properly so there is a reasonable chance you are buying spam traps. Don’t take that risk. By using double-opt in you can make sure that an email address belongs to a real person. This is a powerful way to catch typos and fake email addresses that could be spam traps. Use an address validation tool on your enrollment page to catch typos and non-existing email addresses before they make it to your mailing list. Pay attention to bounce notifications and make sure to remove invalid email addresses from your active mailing list before they turn into spam traps. Add invalid addresses to a suppression list to make sure you don’t reacquire the same address or accidentally send to it again. Chronically inactive subscribers aren’t of any value to your campaigns and some of these addresses are at risk of being converted into dead address spam traps. Be wary of holding onto these addresses for too long.